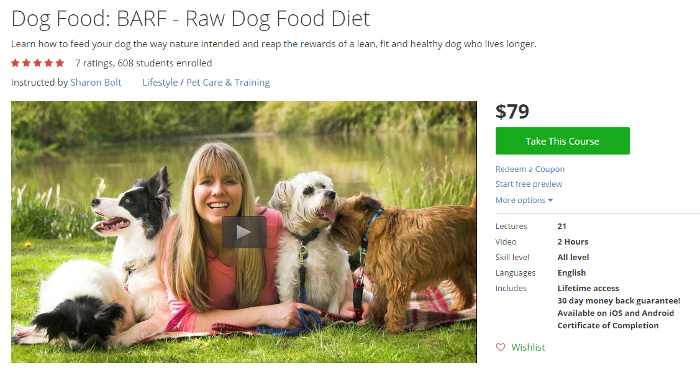 Raw Food Diet For Dogs - Hear Me Roarrrr! A raw food diet for dogs is also known as the BARF diet (short for 'Biologically Appropriate Raw Food' or 'Bones And Raw Food'). It's also thought to be 'evolutionary appropriate' - meaning it's much closer to what your dog would eat if he were running around in the wild and choosing his own food, rather than playing fetch in your back yard and waiting for you to pour kibble into his bowl. What Exactly Is a BARF Diet? When you feed a raw diet to your dog, meals are based around raw, meaty bones and whole fresh carcasses such as chicken, duck, rabbit, fish (but not raw salmon), veal and so on. Offal (organ meats) are also included as is raw 'green' tripe. Raw Pork isn't generally recommended because it can contain the virus which causes a disease called 'pseudorabies'. However if you do want to add Pork to a raw food diet for dogs, it's best to freeze it for several weeks before using as this will kill the virus. Whole eggs (including the shells), yogurt, cottage cheese and even some nuts can be given plus a healthy serving of finely ground or juiced raw fresh fruit and vegetables. Grains aren't necessary, but if you want to add some type of grain, try oats or brown rice. Any meat used in a raw food diet for dogs should be human-grade, preferably organic, and free from any artificial additives, preservatives etc. In Europe, feeding a raw food diet for dogs is much more common than it is here in the US, and veterinarians often recommend it. Although it's different in the USA right now, feeding raw dog food is definitely becoming more popular, especially since the dog-food recalls and scares of the previous few years. Here's a wonderful video presented by Australian Veterinary Surgeon Dr Ian Billinghurst, author of some of the most definitive books on the BARF diet. There certainly seem to be a lot of good reasons to consider a raw diet for dogs - and although the majority of them are to the dogs' benefit, there are some 'pluses' for you too! Eating raw dog food also reduces or eliminates certain 'doggie odors' - eg. odors associated with yeast infections, certain skin conditions and dental problems caused by tartar build up or gingivitis. A benefit that probably means more to you than to him is that your dogs' stools will be less frequent, smaller and far less 'smelly'! Eating a raw dog food diet can help slow down those 'chow hounds' who practically inhale their kibble, because they actually need to chew these type of meals! Is generally less expensive than feeding commercial dog food. But if you don't live near a butcher or a store where you can get raw meat and scraps, you may not notice any savings. Of course there are two sides to every coin, and there are drawbacks associated with feeding a raw dog food diet. There is a risk of bacterial illness such as e-coli and salmonella. This could affect your dog who's eating the food, or you, the owner, who is preparing it. Obviously it's important to follow good kitchen hygiene and wash your hands, utensils and work surfaces thoroughly. Preparing a raw dog food recipe for dogs can be messy, time-consuming and not very convenient if you're traveling, or have a busy schedule. Then there's the time spent tracking down the right ingredients. 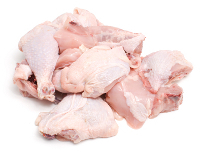 It can be difficult to find the right raw meat components - if you have a local butcher, chicken processing plant, or grocery store who will work with you to provide bones, carcasses and such it will be much easier. There's a learning curve involved - for the dog owner that is! Veterinarians here in the US often don't understand or support this type of diet. Also, bear in mind that puppies have very specific and unique nutritional needs. Although a raw food diet is fine for an adult dog, it is usually not recommended for a puppy because it is tricky to meet a fast-growing puppy's demands. For the first year or so (longer for large and giant breeds), feeding a premium commercial puppy food may be the best way to keep up with his body's needs. THEN you can switch to feeding raw once he's mature. If you DO decide to feed your puppy a raw diet, take extra care to make sure the balance of nutrients is correct, and that you change them to keep up with his needs as he grows. As always, do talk to your vet if you have any questions about your puppy, or dog's, diet. Meat should make up between 50 and 70% of a raw food diet for dogs, within that figure it's recommended that you should have a 1:1 ratio of bone to meat. Aim to feed about somewhere between 2 and 3% of his body weight in raw food per day. For example, a 50lb dog will eat approx. 1lb - 1.5lbs of raw food per day. Divide that amount between two meals if possible. When it comes to the type of fruit and vegetables to use in a raw food diet for dogs, all things are NOT equal! Some of them can cause an upset tummy, or worse - could possibly cause canine bloat in large, deep-chested breeds. Others are actually toxic. Here's a short list of the ones that are recommended, and those that are best avoided. Bear in mind that it's not an exhaustive list though! Carrots, Parsley, Celery, Zucchini, Potatoes (but WITHOUT the skins), Cauliflower, Leafy Green Vegetables (such as Mustard Greens, Brussel Sprouts, Romaine Lettuce), Peas, Parsnips, Peanuts, Walnuts, Almonds, Strawberries, Blueberries, Apples, Bananas, Pears, Melons. Experts in feeding a raw food diet for dogs believe that you can usually switch a dog from commercial food to a raw diet quickly and without him suffering from digestive upset. This applies to healthy young dogs who don't have gastro-intestinal or immune system problems. However, if your dog is older, or has digestive/immunity or other health issues, you may need to take things a little more slowly. Australian Veterinary Surgeon Dr Ian Billinghurst (whose video is featured towards the top of this page) has written some excellent books for dog owners who want to feed their dog a raw diet. There's something for everyone, from 'first-timers' to professional dog breeders. Contains vital information on feeding dogs their natural or evolutionary diet. It's packed with practical, easy to follow advice and explains why processed foods are a major cause of growth, reproductive, dental and many degenerative canine diseases and conditions. A must-have for anyone who wants to know more about a raw food diet for dogs. Perfect for both beginner and experienced BARFers! Learn the hows, whys and wherefores of the BARF diet here. Perfect for breeders who want to produce and raise healthy pups using the raw dog food method. Also a great supplement to the first book on this list ('Give Your Dog A Bone') for puppy owners who want to get their pup started out on the right paw! 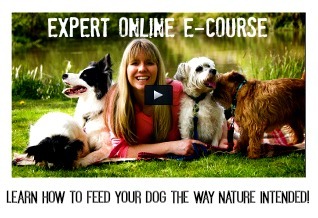 If you'd like something more 'hands-on', check out this comprehensive e-learning course by UK dog-care professional Sharon Bolt. It'll teach you absolutely everything you need to know about the BARF diet, and how to use it to help your dog in so many ways. There are supporters on both sides of the commercial dog food and raw dog food debate, and you'll find that there are most definitely 'pros and cons' to each choice. An appropriate and nutritious diet is vital to your dogs' health and longevity, and whichever route you take (raw, commercial or home-made) the 'proof of the pudding' is in the health and overall condition of your dog. If you feed a premium dog food and your dog is healthy and full of energy, has no allergies or skin problems, and no degenerative, digestive, or immune system problems, and you're happy with the food you've chosen, then THAT is probably the best choice for you and your dog. The same applies to a raw food diet for dogs, or even a 'semi-raw' option, be it dehydrated, frozen or pre-made meals. A happy, healthy dog is what you're aiming for....... what path you take to get there is decided by your own choices, needs, lifestyle and so on. Just give it some thought and then choose the option that feels right for you (and your pet! ).